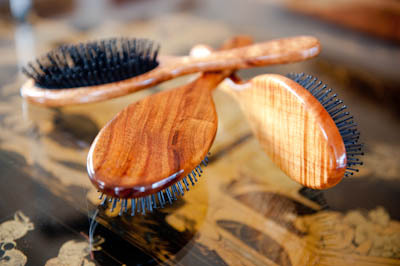 Forty years of woodworking experience has shaped our exquisite line of hairbrushes, while our relationship to community and family has informed the business model. 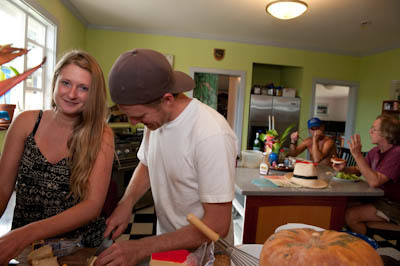 We designed the business to include roles for our grown children, as well as for our friends and fellow woodworkers on the coast, whom we count as ʻohana (extended family). This helps the economy of our community as well as giving us a creative resource far deeper than what we would have if we were a stand-alone operation. It is also a lot more fun! Our working philosophy for what we build in our shop is simple. We make things that we would want to keep for ourselves, of a quality consistent with the value and beauty of the woods with which we work. 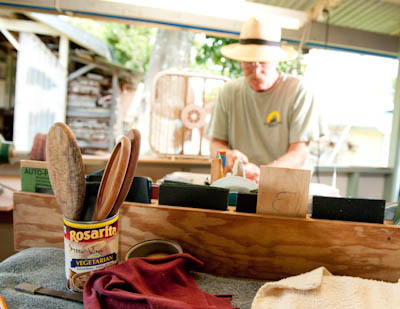 Our brushes begin as wooden blanks taken from deadfall trees or large broken limbs. We select from the finest of our stock, looking for color, figure and character. The material is milled in our shop to the rough shape of the hairbrush handle, then worked by hand into its final form, sanded to 360 grit sandpaper, finished with steel wool and hand rubbed. The finish we apply, a clear gloss, is waterproof and the most durable we have found. We have chosen a type of hairbrush head that combines the time tested pneumatic cushion with the contemporary and popular nylon pin with a small ball on the end. We also offer heads with only the straight pin and no ball tip. 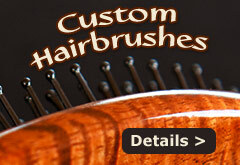 The brush heads are removable for cleaning and replaceable through our website.